When we think of historic architecture, we tend to think of ancient Greek and Roman structures and facades. However, less than 200 years ago, one architect profoundly influenced the look and feel of Barcelona for the better. 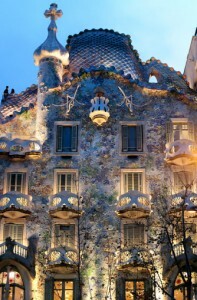 That architect is Antoni Gaudí, whose works closely followed the modernista movement blossoming at that time. Casa Batllo, designed by Gaudi in Barcelona. Born in Reus in 1852, Gaudí received a degree in architecture in Barcelona in 1878. Inspired by nature and organic influences, his modern designs dared to deviate from the norm. Although he followed the modernista movement, he had his own distinct style marked by floral, reptilian, baroque and geometic designs. In fact, the most-visited attraction is the Sagrada Familia, a massive basilica which was not completed during his lifetime, and is in fact still under construction! It’s on track to be completed by 2026, exactly 100 years after his death. Some of his other notable works include Casa Batlló, a home designed with skulls as balconies and vivid ceramic tiles mimicking the color of sea coral. The Park Güell is a showcase of various sculptures, tiles and buildings designed by Gaudí for the aristocracy. All throughout Barcelona you can see Gaudí’s work, but this seaside city has plenty more to offer. Wine and tapas enthusiasts can find great opportunities around every corner, as well as a bounty of museums full of inspiration works. And for those who enjoy a romantic and magical nightlife, Barcelona is as good as it gets for an enchanting night you won’t forget! There’s something in Barcelona for everyone, architecture enthusiasts and shopping fanatics alike. The city itself is one of Spain’s top tourist destinations due to its charming location, beautiful building, and abundance of things to do and see. Gaudí chose a great place to make his mark! AESU offers several trips to Spain, including: Euro Explorer and Continental. Explore Spain and its spectacular landscapes, plus see Barcelona and behold the celebrated architecture and enchanting streets. This entry was posted on Thursday, March 17th, 2016	at 11:00 am	. You can follow any responses to this entry through the RSS 2.0	feed. Both comments and pings are currently closed.